Weird Al wrote a song about it, Clark Griswold tried to talk the kids into seeing it, Guinness World Records recognized it, and we finally visited it. 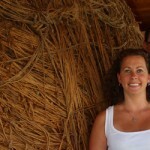 Mind you, this is the world’s largest ball of twine created by ONE man – Francis Johnson. Construction began in 1950 and did not conclude for 29 years. He then covered it with a steel structure to encourage viewing. And, people did – lots of people. Looks like you guys are having a great time. We miss you! why not? seriously, i think that’s it, just something to do. I’m with Jean. We’re all living vicariously through you two. Thanks so much for all the bucket list “must dos” and “must sees” you’re helping us all check off our lists.